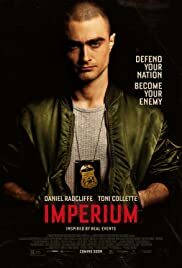 Even the title of this film is terrifying: IMPERIUM – 'English-speaking Neo-Nazi frequently refer to a "Western Imperium" as a theoretical future global empire following their political and philosophical views.' Unfortunately the theme of this film is based on true incidents as written by Michael German with Daniel Ragussis who also directs. It is a magnifying glass held up to the many organizations of racists who believe that all non- Caucasian people should be destroyed – the white supremacists, be they KKK, or any other of the many hate groups whose influence is being more intensely felt during these times. It is a difficult movie to watch but at the same time perhaps it is a film that more people should see to be aware of a threat to equality that abounds, especially since January 2017! 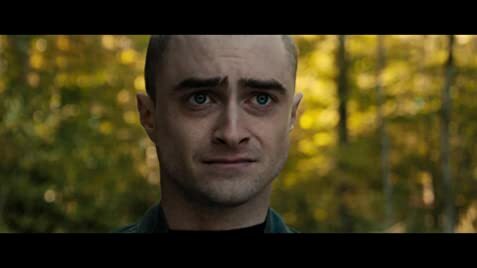 Idealistic FBI agent Nate Foster (Daniel Radcliffe) goes undercover to take down a radical white supremacy terrorist group. The up-and-coming analyst must confront the challenge of sticking to a new identity while maintaining his real principles as he navigates the dangerous underworld of white supremacy. He works in tandem with Agent Angela Zamparo (Toni Collette) and Tom Hernandez (Nestor Carbonell) to infiltrate various groups led by Tracy Aletts, Sam Trammell, Seth Numrich, Jasson Finney etc. The concept of FBI infiltration may not be a new one, but when it is based on a series of true events is underlines the dangerous world we have created. The film is very long u the cast is strong and the action, while at time convoluted, is fast paced. Daniel Radcliffe does a star turn!